Reserve Champion San Diego Derby; Semi-finalist NCHA Superstakes; Arizona Cutting Horse Association Classic Finalist, etc. DUALLY PEP (SMP) progeny have only just begun to show this year. Doctor Dually Pep AQHA Superior Reining Horse, qualified for AQHA 2010 World Show Senior Reining, multiple circuit championships. By PEPPY SAN BADGER. NCHA Hall of Fame. 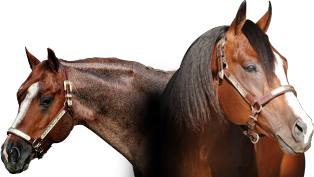 Equistat #2 All Time Leading Cutting Sire, and an NRHA & NRCHA All Time Leading Sire, siring earners of over $25,000,000; including LITTLE BADGER DULCE (NCHA Horse of the Year, NCHA Open Reserve World Champion, NCHA Open Futurity Reserve Champion). 1st Dam MISS DUAL DOC, by Doc's Remedy. Dam of 14 foals of performance age with 11 money earners earning over $729,407 including: DUAL PEP $313,192. NCHA NP Challenge Champion, NCHA Breeders Cutting Classic Reserve Champion, NCHA NP Classic Champion, NCHA Classic Champion, #7 All Time Leading Cutting Sire, and more. JUST MISTER DUAL $138,760. Finalist NCHA Open Futurity, PCCHA 4YO Open Cutting Stakes Champion. DUAL PEPPY $89,450. AQHA Reserve World Champion Senior Cutting, NCHA $10,000 Novice World Champion, PCCHA Open Derby Champion, #11 Leading Reined Cowhorse Sire. NITRO DUAL DOC $61,338. NCHA Open Futurity Finalist, NCHA Open Derby Finalist, Memphis Open Futurity Finalist, Memphis Open Derby Finalist. MISS PLAIN DUAL $51,694.Red Bluff Open Classic Co-Reserve Champion, Reno Western Open Futurity 3rd and Dam of Miss Plain Reminic $4,980. MISTER DUAL PEP $43,785. NCHA Open Superstakes 4th. Finalist Gold Coast 4YO Open Derby and more. MISS DUAL BAR $14,135. Rose Cutlip Open Derby Co-Reserve Champion, Harris Ranch Open Derby 4th, Finalist PCCHA Open Derby and dam of Miss Peppy Jay Bar $163,279. JUST MISS DUAL $1,403.